As a child, whenever I accompanied my mother to the local temple, pouring water on ShivLinga and other members of the Shiva family was a norm. She also asked me to pour cold water on a little insignificant goddess seated just outside the main temple near Peepal tree who was dressed up in the usual fineries and was riding a donkey. She had four arms and carried a broom, a fan, small bowl and a pot of water. My mother told me she is Shitala or Sitala, and she should be kept cool as she protects us from fevers and skin rashes. I was always curious about her as a child but soon forgot about her as she was never the main deity for us nor we ever had a photo or idol of her at our home. Decades later, I got a chance to know her as I came across plenty of books and articles on this little-known Goddess. 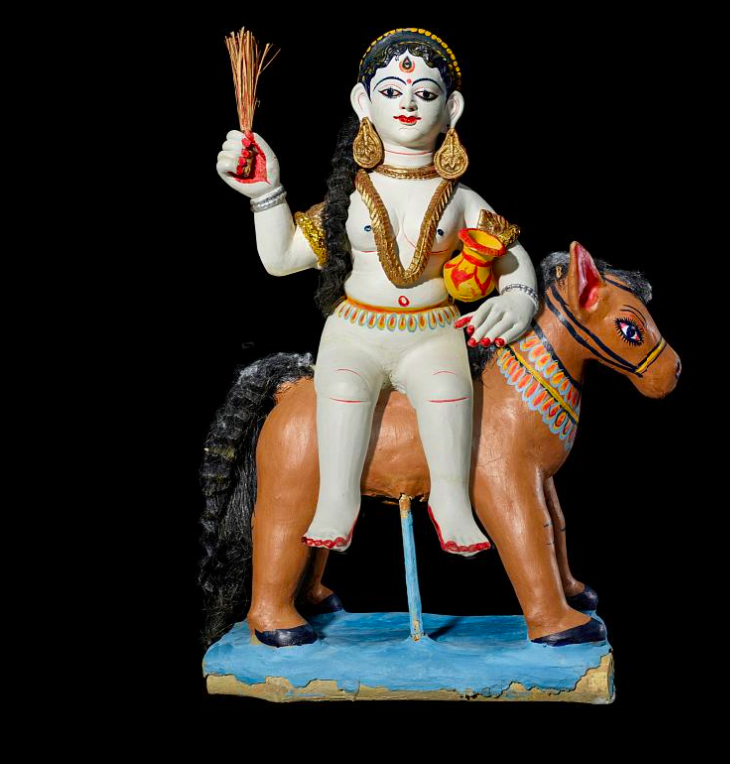 Goddess Shitala is often associated with smallpox, chicken pox and measles, and other deadly skin diseases which causes fever, blisters, and rashes. The condition is locally called ‘mata nikalna’ or grace of the goddess. Her consort is horse-headed Jvarasur meaning the demon of fever. Eradicated now, more than a million people died in India until 1950’s of smallpox. In the book, Bugs, Drugs, and Smoke, a World Health Organization publication, it is described that how health care professionals in India in 1970’s followed people who came to make offerings to Shitala Mata temples and identified smallpox patients. In the book, Religion, Devotion, and Medicine in North India- The Healing Power of Sitala by Fabrizio M. Ferrari, Shitala is discussed as a benevolent goddess, loving mother and protects from the poxes, fevers and other disorders. With time, she is also known to protect from other diseases. Ferrari writes that for the mallahs of Adalpur and Banaras, Goddess is not chiefly associated with smallpox. Shitala is an auspicious mother whose presences causes good luck and prosperity. Nicholas, Ralph W. in his article, ‘The Goddess Sitala and Epidemic Smallpox in Bengal’, in the The Journal of Asian Studies 41, no. 1 (1981) writes that Shitala is a vital deity of villages in southwestern Bengal, and her rise to importance is closely related to the history of smallpox. However, no mention, of her is available in Ayurvedic medical texts. Bhava Praksha, a medical textbook written by Bhava Mishra in A.D. 1588 talks about a disease masuri or smallpox. Masuri also means a kind of lentils. Mishra advises worship of Shitala amongst other remedies to get rid of this disease. Skanda Purana also refers to Shitala and Sheetlashtak, her main strota is believed to be written by Lord Shiva. David Kinsley in his book Hindu Goddesses-Visions of Divine Feminine writes that worshipping Sitala provides people with the realistic and continuous view of life where good and bad things happen and are both are an inevitable part of life. The circle of life goes on and her grace can be both good and bad. Marriyaman is a similar goddess associated with smallpox in southern India especially Tamil Nadu. It is interesting to see how cultures, devotion, and lives of people blend seamlessly giving varied meanings and interpretations to the female divine. Previous What about the breast? “Mata Nikalna” — its similar in Telugu too! May be its not Sital, but some other local goddess (like Pochamma or Poleramma). Interesting to see how the same disease is associated to goddess. In south, I guess this particular association is with NEEM tree and Pippal is for the “well known” goddess – as the pippal comes from VEDAS (“Pippalaṃ is the abode of two suparṇas – eagle birds” says veda. Also, pippal tree is associated to “initiations” (like Hayagriva Vidya, etc)). But NEEM tree is always used by these local devotees for ailments. Interesting though! You said Sital is not mentioned in Ayurveda. But Ayurveda is very old – its a upa-Veda. Sital might be time and space constrained and must have been recent! But, may be we can find “SIMILAR” association. Why did you specially point this out though?! I like your blog exactly for this. You bring to light the hidden goddesses. 🙂 How is the Sital Ma doing these days though? Did you visit recently? It will be interesting to see how people changed the worship mechanisms over the time! There are large numbers of goddesses who are hidden in various texts, folklore, and other scriptures. Their worship declined over the period..due to multiple reasons. (one being, natural order as you had mentioned previously). I wish if we all know and appreciate our traditions, old lifestyles and see the connections between local gods and goddesses … mainly how divine takes human form and sometimes human takes the divine form. There are many older texts where specific gods and goddesses are not mentioned or are given prominent role. But after a certain period, these village deities acquire prominent place. And vice versa. Hows and why are very important here. This helps us tell a lot about the beliefs, practices and in general about the formation and development of culture in a society. It shows how everything is so fluid and changes with needs and circumstances. Everything yet remains the same! So true! This aspect of unity in diversity when known to the root level, we can really understand the cultural evolution!! Oh ya..not much change in Punjabi Hindus way of worship but I have seen people from other regions worshipping and fasting for her. Isn’t it interesting to see how people from Rajasthan to Bengal to Telugu have developed their own way of worshipping the same (somewhat) goddess? Yea…interesting and rises more intriguing questions of his and when aspects! What do you think of her symbology? Donkey, broom, etc? Did you see these symbols in other goddesses? This is first time I am seeing a broom and donkey! May be the meanings of carrying all our burden and removing all the filth that hovers us are symbols – but is there more?! I think broom, water, bowl full of (germs) all also point towards cleanliness. Donkey is surprising though. Tell me, are these local goddesses worshiped by a priest? A brahmin priest? It’s a question to see how a vedic lineage diversified into folklore! If the priests are of the brahmin class then the worshipping utterances should trace back to popular gods and goddesses. Thus we can link and see how the diversification occurred! Agree, we can make as many inferences as we want but they may or may not be correct or reflect the thought process in those times. Coming to the second part of your response, there is a difference between vedic goddesses and village or local goddesses. Vedic goddesses were more benign, soft, beautiful and more related to fertility, prosperity, marriage and child birth whereas village goddess were rather untamed with wild hair, sometimes angry, mostly single, childless. Ofcourse…. What I mean to ask is.. Are there “priests” in the temples of these local goddesses. Because, a priest will have to be initiated according to vedic rites. So, they will have to perform puja for local Goddess based on some “mantras/utterances”. And we know for sure, this worship is for a local Goddess and the black box is How, a lineage of “priests”, starting from and still linked to vedic culture, are yet worshippers of folklore! So I strongly feel the family line of priests will definitely know the origin and transformation of these folk goddess(s)! Do you get my point!? Oh yes, ofcourse these people (who manage the temples though not neccesarily priests) will know the local history. Please check your nomination for Liebster award.